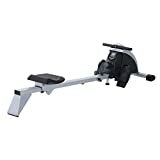 This HOMCOM indoor rowing apparatus is a great item to have as part of your exercise regime, the rowing machine can be a great way to exercise your legs, waist and upper body. It has a compact design which can be use full for small spaces and a perfect partner for any home gym. Made from a steel frame, it also features 8 levels of adjustment and a padded set for comfort. There is also a monitor to track your progress and will give you information on time, calories and frequency. A great tool to have and be part of your healthier lifestyle. This entry was posted in Fitness Products and tagged Adjustable, Cardio, Grey/Black, HOMCOM, Machine, Medium, rowing, Unisex, Workout by Summer 365. Bookmark the permalink.